I used to rarely wear perfume, but since I discovered I can smell like cake and other similar things, I’ve really started collecting indie perfumes. I came across Common Brimstone on Etsy in my search for more yummy smelling goodies. They are located in Cambridge in the UK so it did take a bit longer for my perfume to get to me (about a month after I ordered), but shipping was still quite reasonable at just over $5. Common Brimstone has a variety of scents in both oil and solid perfume form. They’re quite affordable starting at $8.80 for perfume oils and $4.06 for 3 mL solid perfumes. 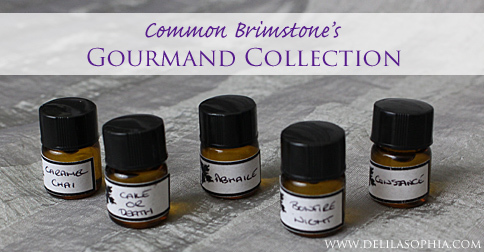 I chose the Gourmand Sample Set (of course) for $8.80 which is a set of five 2 mL vials. Now let’s jump into the fun part, the review of the oils! Starts with warming gingerbread and finishes as a delightful chai fragrance, enriched with swirls of sweet caramel and hints of spicy cardamom and nutmeg. In the vial, I definitely get the gingerbread and chai, and then sort of a less obvious cardamom and nutmeg. When first applied, it’s very similar to the scent in the vial, maybe a bit more of the gingerbread. Then as it wears it becomes a bit more fragrant with the chai. I love Chai tea so it’s not surprising that I liked this. It’s a very warm scent, so I can see myself reaching for it often as the weather gets cooler. This is the longest wearing of the bunch for me as it lasted over night! Hints of baked apples and marshmallows spiked with warm cinnamon. There’s a dollop of sticky toffee and orange peel on top, and a whisper of woodsmoke underneath. In the vial, I really don’t get the notes in the description. I get a lot of the woodsmoke and to be quite honest it kind of reminds me of teriyaki beef jerky. Again, when applied it’s very similar to the scent in the vial. Honestly, I couldn’t wear it long enough to see how it wears. I feel like this is the only one of the bunch that I didn’t care for and that could be due this particular perfume reacting to my body chemistry. Rich notes of carrot cake and hot chocolate create a luxurious feel, while chestnut and cinnamon keep this from being too sweet. A base of French vanilla completes the gourmand experience. In the vial, this is definitely a spicy carrot carrot cake and I get a bit of the chocolate too. On the skin the spices immediately pop, but then it blends into a spiced hot chocolate and warm carrot cake. I do start to get the French vanilla as it begins to wear on my skin. I can see this being lovely for fall and winter. Luscious red velvet cake blends beautifully with elegant cognac for a delicious gourmand perfume experience. In the vial, this smells just like red velvet cake! I am thrilled to have found a red velvet! On the skin the frosting fades and it softens to a light devil’s food cake scent, but it does fade quickly (an half hour or so on me). A comforting bakery blend of cookie dough, fresh baked bread, rich butter cream, butter, and a cup of white tea with a sprinkling of sugar. In the vial, this does smell just like cookie dough and I do get a bit of something else, maybe the baked bread? It’s quite different from the usual cookie dough scents as it’s not so foodie. In general, I feel like this was definitely a good purchase. These are all very close to the skin scents and, with the exception of Caramel Chai, they tend to fade pretty quickly on me. However, I enjoy the variety and I don’t mind reapplying every so often. I also really liked the inner caps as they make them so much easier to apply. I purchased the items for this review. All opinions are my own honest thoughts.